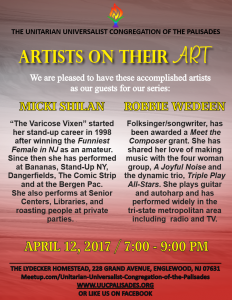 Join UUCP on Wednesday, April 12th at 7:00 PM for our “Artists on their Art” Series. 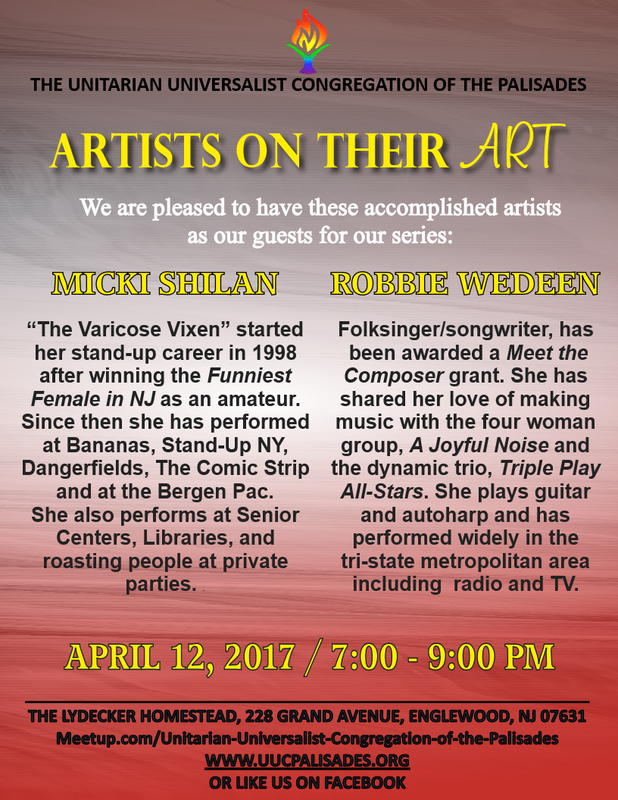 We are pleased to have two very accomplished artists for our “Artists on Their Art” series: Micki Shilan and Robbie Wedeen. Robbie Wedeen is a Folksinger/Songwriter. Robbie Wedeen’s original songs draw from the diverse musical forms such as blues, English and Irish ballads and music of the Renaissance. Her repertoire of traditional folk music includes ballads, blues, gospel, spirituals, old-time, country, children’s songs, women’s songs, and international songs. She plays guitar and autoharp and has performed widely in the tri-state metropolitan area including radio and cable TV. She has toured in Europe, as well. Over the years, Robbie has contributed to the folk music scene as sa performer, songwriter, and producer of creative programs and folk festivals such as the Teaneck Folk Festival. She has been awarded a Meet the Composer grant. She has shared her love of making music with the four woman group, A Joyful Noise and the dynamic trio, Triple Play All-Stars.